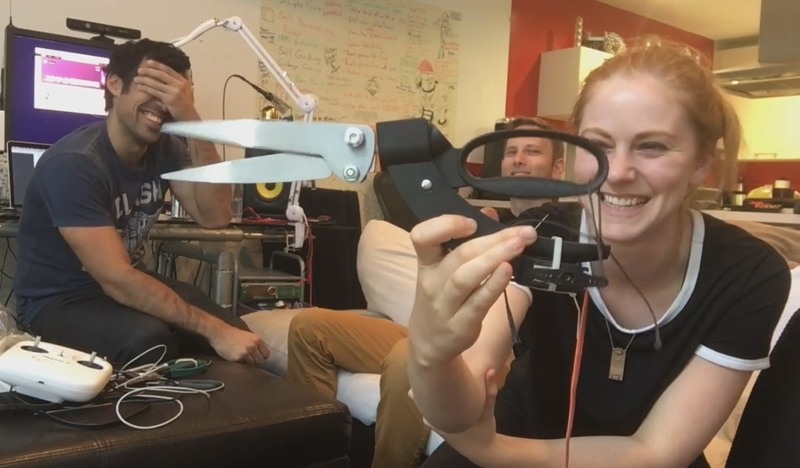 What happens when carefree hackers Simone Giertz and Samy Kamkar get together for a lazy afternoon? A lunatic plan to cut hair using a drone and a pair of automatic scissors. That the plan is doomed to fail from the start doesn’t deter Simone and Samy, and why should it? As you can see in the video, the plan isn’t to put stylists out of work but to have fun trying to do something ridiculous and new. The downdraft alone from the drone would probably make a decent haircut impossible, and then there is, of course, a serious risk of being stabbed in the ear by robo-scissors — almost certainly a first, but one of dubious merit. Giertz is no stranger to automating sharp things to terrifying effect, but Kamkar’s hacks are often — and I mean this in the best possible way — borderline criminal. It was he, for instance, who made a robot that cracks combination locks in seconds, and a system for taking over other people’s drones. You really should follow Simone and Samy on YouTube.